I am busy baking rusks (they are in the oven right now!) and it is my first batch – ever! 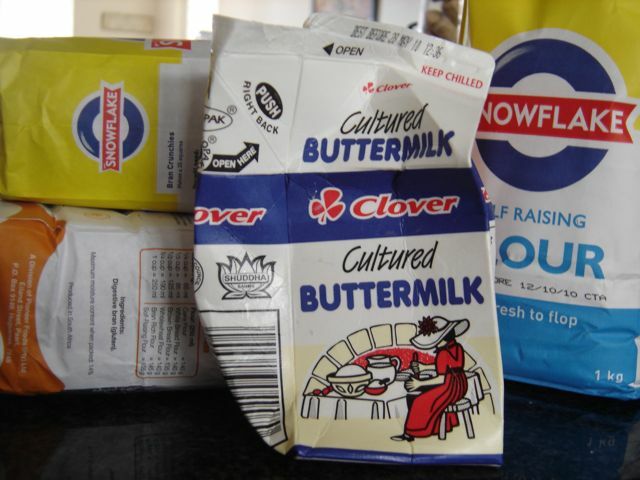 As I was opening the carton of buttermilk (see pic), I remembered my grandmother. She used to drink the buttermilk just like that – it was probably her absolute favourite treat. I guess it is quite normal to drink buttermilk, but I have always thought of it as sour milk or ‘milk gone bad’! I would look at the white chunks in my grandmother’s glass and not understand how she could love this so much. Well. I think a rusk-baking, buttermilk afternoon is the perfect time for writing a praise poem, the perfect time for thinking about where I come from and who I am! the ocean, the fields, the dust, the mountains. my hands are made of ice. I am not to be captured in a cage. but I do this to protect myself. lifting my head slowly at the suggestion to run. You are so welcome to place your own praise poems here!! Dis baie, BAIE cool! Sterk en confident – not making any excuses for who you are. Wow – dankie Alida!!! Haha – my hande is nog net so koud!!! Mis jou ook… waar is die dae? !